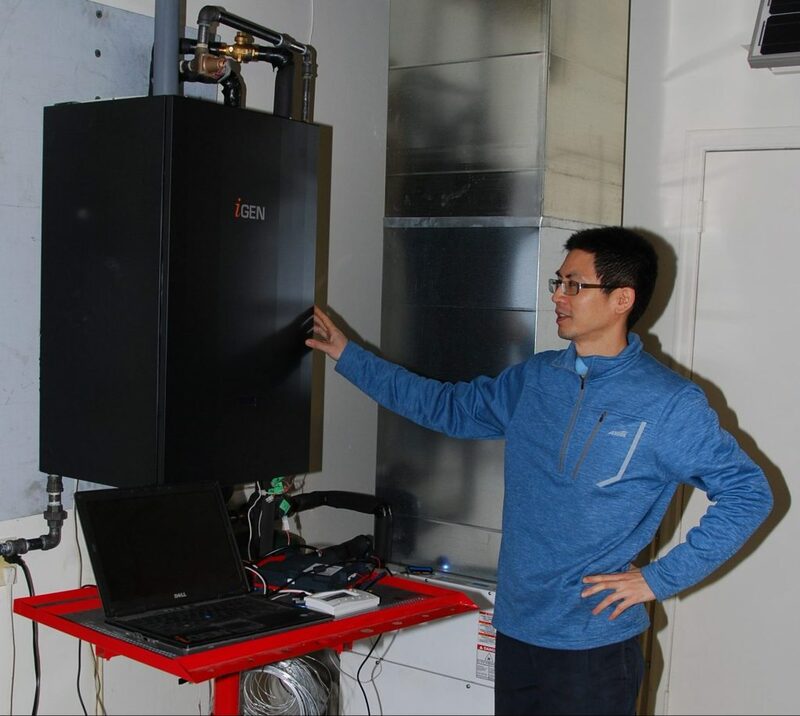 Engineer Patrick Lai explains the operation of the iGEN i2 heating system. Lengthy power outages in various regions of the country in recent years have driven home the fact that virtually every heating appliance requires electricity to operate. Even where adequate gas pressure can be maintained, if blower motors, pumps and controls don’t have power, the appliance shuts down. One small Richmond Hill, Ont. manufacturer has developed a natural gas (or propane) fueled space heating system that generates enough electricity to run itself. Two mechanical engineers, Patrick Lai and Michael Chatzigrigoriou, started iGEN Technologies in 2012. By combining aspects of refrigeration, hydronic heating and forced air, they have developed an appliance that generates its own electricity and can replace either a forced air furnace or a heating boiler. They have begun pilot installations of their i2 wall-mounted heating system and will launch a larger pilot project in the fall. Electrical output is closely monitored int his lab installation. “When we had that ice storm in 2013 where some homes experienced anywhere from one day to one-week power outage, we knew we were on to something. Here, you have an appliance that can replace your existing furnace or boiler to heat your house, but in addition to that it generates electricity. And it generates enough to run the appliance itself but also when coupled with a battery, it gives you blackout proof operation,” said Lai during a recent P&HVAC visit to the company’s plant. The key to the new heating unit is a technology called the refrigerant vapour expansion cycle (VEC), sometimes also referred to as the organic Rankin cycle (ORC). 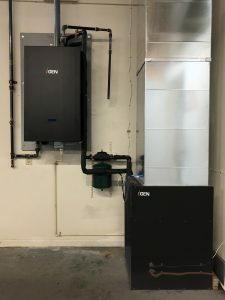 “We wanted something that would be cost effective, but also serviceable by the existing HVAC contractor base,” said Lai, chief technology officer for iGEN. “So, we avoided things like the internal combustion engine, or fuel cells, or Sterling engines, etc., because all that is relatively exotic and typically not present in Canadian homes. 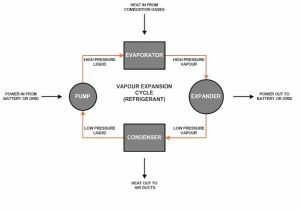 With the vapour expansion cycle, the nice thing is that it is the complete opposite of an air conditioner, so when you picture how an air conditioner works internally, where you put power into the compressor, you get a cooling effect. We’re doing the opposite with our system. We’re putting high temperature heat into a refrigerant loop and from there you get high pressure vapour that turns the expander – a compressor operating in reverse – and from that you generate electricity. Our concept is simple to understand, and we try to use existing off-the-shelf parts wherever possible,” added Lai. The system is designed around the vapour expansion cycle (VEC). The obvious comparison is to a heat pump, but it’s not the same. The iGEN heating system is made up of two parts – a VEC module and an air handler. The VEC module generates enough electricity to run the pump, the air handler and controls. Natural gas burners in the VEC heat a primary water loop that transfers heat indirectly to the evaporator. The heat vaporizes the refrigerant. After the energy is extracted from the vapour, the refrigerant turns back into a low-pressure liquid. It is pressurized by the pump, which restarts the cycle. “The heat that comes off that refrigerant cycle is what is used to heat your home,” said Lai. 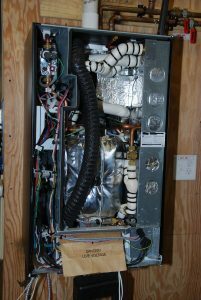 Heat from the condenser is transferred through a hydronic water loop to the air handler and then through ducts to the home. Inside the box, off-the-shelf components help keep things straightforward for the heating technician. Obviously, when the unit is not operating it is not generating electricity. How does it start? When it receives a call for heat from the thermostat, a standard lithium-ion storage battery, about the size of a car battery, starts the i2 appliance. 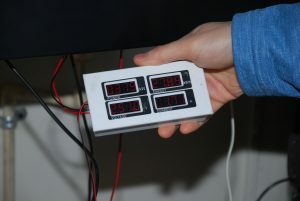 Once running, VEC module charges the battery. “That coupled with some smart electronics is what allows the unit to operate independently of the grid,” said Lai. In the summer, or when no heat is required, a transfer switch automatically switches the air handler back to grid operation for cooling or ventilation. At the time of Plumbing and HVAC’s visit, iGEN was close to finalizing the i2 appliance for the market and working through 15 generations of prototypes. The first prototype was developed in Chatzigrigoriou’s garage. The company worked with the University of Toronto on some of the earlier development. This moved iGEN’s R&D forward to the point where now its unit is going through long-term testing and the certification process to allow it to be sold in North America. It is already field approved for use in Ontario. The company has completed several demonstration installations. This forced air installation is similar to that of a combi heating system. “We’re at the point where we are starting early adopter sales,” said Lai. A number of pilot installations are planned for the fall. The unit will ship with the primary water loop and refrigerant loop pre-charged. Field installed connections include combustion venting, gas and hydronic piping, ductwork, power cables and thermostat wiring. There are basically two configurations for the iGEN equipment. One is designed for hydronic radiant loop heating, replacing the boiler. The second is like a hydronic combi unit, except the wall-mounted iGEN unit replaces the water heater and operates through a hydronic air handler, for homes equipped with forced air heating. “It’s still heating only, there’s no domestic hot water – that’s maybe down the road,” said Lai. Like any appliance, the iGEN unit has to meet a certain price point to be viable in the market. Increasing the electrical output to be able to power an entire house would substantially increase the cost and complexity, said Lai. Initially, sales will be through prequalified contractors. One target market is premium cottages. They need “uninterruptable heat” to avoid frozen pipes in the case of a winter power outage. Like any product, refinements will be continuous. If the company finds that people are demanding more power generation and are willing to upsize the battery, then the company will look at backing up other critical home appliances such as gas-fired water heaters, computer equipment, etc. “We want to see what the uptake is with our initial i2 appliance and then we’ll go from there,” said Lai. For more information, please visit www.igentechnologies.ca.